Statistics kept by the Hellenic Photojournalists’ Union (EFE) and included in the report indicate that just one of 16 incidents of police aggression against photojournalists between 2010 and 2014 has resulted in legal consequences. In the majority of cases authorities have failed to even identify the perpetrator. The report, authored by Dr. Eleni Polymenopoulou of Brunel University, analyses the legal and structural factors that have combined to obstruct justice. According to the analysis, prosecutions of alleged police violence against photojournalists “tend to stall at the pre-investigation phrase”, a phenomenon that “appears to be related not to the unwillingness of prosecutors to initiate proceedings, but to the unwillingness of the police to cooperate”. Though questions of police violence in Greece are not new – the report makes note of a series of successful claims involving police brutality against Greece at the European Court of Human Rights – incidents involving journalists and photographers are considered to have increased in the context of the country’s ongoing financial and social crisis. Most of the photographers who suffered police aggression were attempting to cover anti-government protests; in a few cases, police are accused of failing to protect photojournalists from physical attacks by members of the extreme-right-wing Golden Dawn party. Griffen urged the Greek authorities to adopt the report’s recommendations. In addition to ending impunity, these include restructuring SAIs to ensure impartiality and effectiveness, enforcing rules on police identification badges and providing human-rights training to officers. 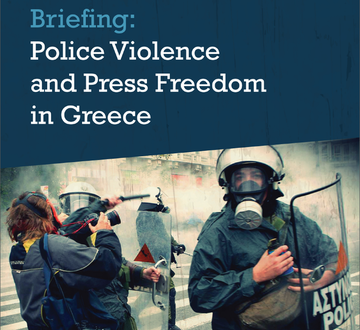 Police violence was a key topic of IPI’s November 2015 mission to Greece, carried out with the South East Europe Media Organisation (SEEMO).